Period grapes, raisins and currants. sugar-msg, vegetables-msg, fruits-msg, vinegar-msg, pomegranates-msg. told by neighbors that it yielded gallons of grapes last year. Does anyone know of anything within period that these could be used for? bottles of wine from them. California at an alarming rate). satisfactorily substituted under any circunstances. grapes give wine made from them. Subject: SC - There are no old world grapes. I was going to stay out of this one, but I feel I no longer have a choice. grapes. From there, all of the European wine industry was in trouble. importing American root stocks, and grafting European varieties on them. predation pressure). So ineffect, there is no longer extant "old world"
Subject: Re: SC - There are no old world grapes. >I was going to stay out of this one, but I feel I no longer have a choice. >grapes. From there, all of the European wine industry was in trouble. >importing American root stocks, and grafting European varieties on them. >predation pressure). So ineffect, there is no longer extant "old world"
it to be the major factor. > So ineffect, there is no longer extant "old world"
that they too are a grape. Currants, approx 4 or 5/16ths of an inch. the majority of cases when a period recipe speaks of dried currents (e.g. because it is readily available in the supermarkets in my area. >currants (red or black) used in period? and if so how were they referred to? distinct from raisins of grapes. >>currants (red or black) used in period? and if so how were they referred to? >distinct from raisins of grapes. called that because they were vaguely similar to raisins of Corinth, i.e. << raysons of coraunce' makes more sense to me as dried currants. What's the logic behind your statement Ras? <Sigh> The word currants is a relatively recent addition to the language. feasible if the source of the fruit was the wild plant. culture, I find it difficult to imagine it's general use in the middle ages. that crop looked like and could be used in place of the original item. several dozen pages of examples and information into a couple of paragraphs. >can buy both at the store. very small dried blackcurrants, etc. > to why these berries are refused as a possible food source?? > vines to make raisins from?? How far off-track am I? > << So the word "rayson" means "dried" or something? > rayson equals rison which is indeed the name used for a dried grape. "raysouns of Courance", or some variant thereof. as the instructor, uses the term "red currant" and "raspberry"
not only the fruit-laden foe, but also the red currants. juice, adding leaves of basil. likely earlier but many centuries in the Greco-Middle Eastern area. find it's way to California. and might be of a size to be in the fridge. labrusca grapes which are the native American variety of grapes. Fresno, California. They are vinifera in ancestry. > > large, dark golden, and very sweet and tasty. we get in the US are dried Thompson Seedless grapes. is the contrast to _sapa_ at the end of this chapter. > that sort of grapes...maybe that's what they're talking about. > shipping methods in period the differences were more profound. microwave method is less messy, and less likely to wash away flavor. De Nola has one recipe which calls for three bunches of "white"
Is there a viticulturist in the house? Subject: [Sca-cooks] how green is 'grene'? and as I read it, it does mean grapes that are black in color. have been destined to be when ripe. Take chekyns, scalde hom fayre and clene. Grapus, and stope þy chekyns with wynne. So þat þay sone boyled may be. For to be served in goode mennys howse. are tastier, and worry more about my dessert! > A post on another list reminded me to ask about Roysonys of courance. > How do you know what to use when? > Christmas gifts one year. So I think it is possible. look for the booming raisin industry in Herjolfness. See what I mean? evidence for the claim, is probably pretty accurate. > Hmmm... raysonys are raisins could courance be Corinth? > Did this get noted in a previous post that I missed? likely. What I did was to use them fairly interchangeably, though. including black currant and red currant. • a berry from such a shrub. England before the little dried grape was a common import item. are the only kinds you can find country-wide. different processes in order to get the different colors. --On Friday, July 02, 2010 1:47 AM -0500 "Mark S. Harris"
"petits pois" are little green peas. don't taste like they would be Concord grapes. on. I've never heard of Concord grapes. in the rugged New England soil. first orders for grape juice came from churches for Communion. combined. Today, growers harvest more than 336,000 tons in the U.S.
purplish color that most grape juice is, this was a rich dark red in color. labrusca. Primarily used for jams, jellies and purple grape juice. Fox grapes are still found all over the Eastern USA. It's even considered a noxious weed in some places. I suspect it's the grapevine growing in my yard that we use Roundup on. You may be able to order the plants and grow your own. 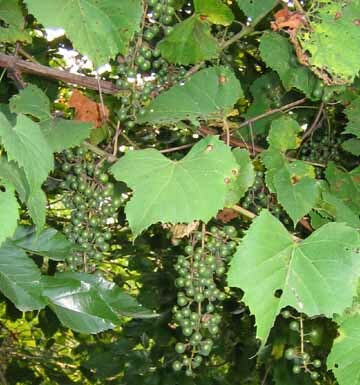 <<< I suspect it's the grapevine growing in my yard that we use Roundup on. them like reg. grapes in their care. in the bag it propagates and I don't like P.I. in my garden. biggest, healthiest Poison Ivy and Poison Oak that you have ever seen. There are a variety of wild grapes.